The client gave me a bit of leeway coming up with the specific design for the cake. Her only request was that it feature her fiance’s love of golf. Despite the fact that it was a groom’s cake, I did want to make sure to add subtle elements of them as a couple as well. She had a list of 10 details about herself and her fiance on her wedding website, and from that, I added elements to the cake to represent them both. For her, I added a red high heel shoe because of her love of shoes and a heart because Valentine’s Day is her favorite holiday. For him, I added a hammer to represent his career and a purple and gold football because of his love of the Baltimore Ravens. For both of them, I added a bottle of Maker’s Mark, their “bourbon of choice,” and their dog, Milly, at the top of the cake. I feel that it is really important, especially for this type of cake, to get to know the clients so that I can personalize their cake as much as possible. 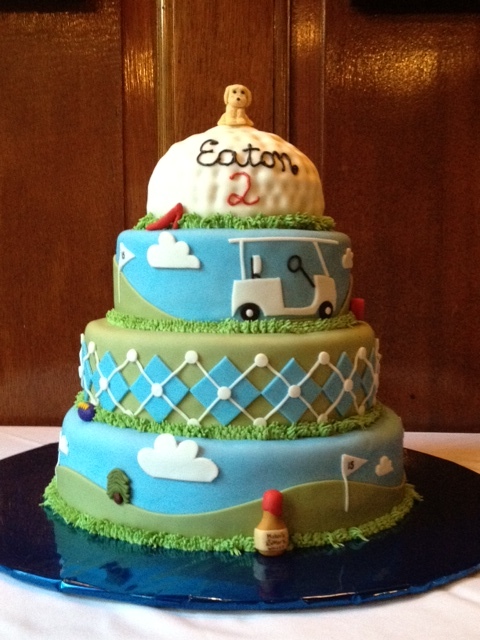 I may make another golf cake, but I guarantee that it will never be the same because of these personalized touches.